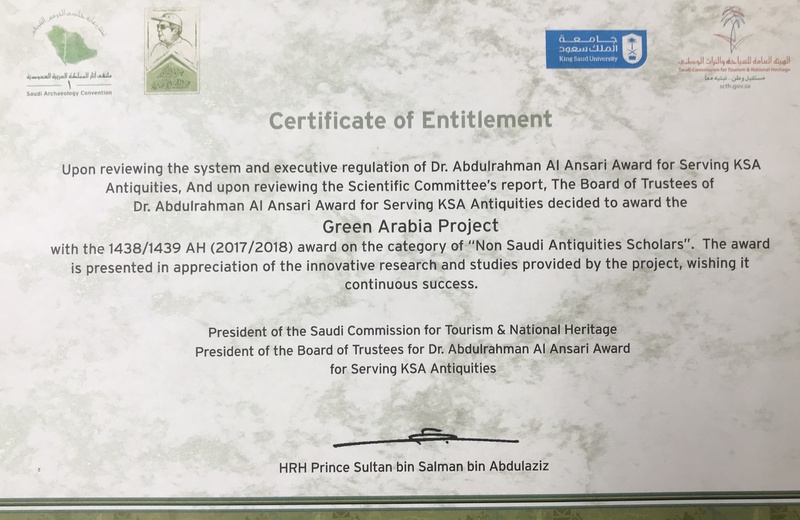 The Green Arabia Project was honoured to receive the Dr. Abdulrahman Al Ansari Award for contributing to knowledge about the prehistory of the Kingdom of Saudi Arabia. HRH Prince Sultan bin Salman bin Abdulaziz al Saud, President of the Saudi Commission for Tourism and National Heritage bestowed the honour on the project. Michael Petraglia traveled to Riyadh, and received the award during the the first Archaeology Convention. The Green Arabia project received an award for its contribution to knowledge about Saudi prehistory.